"These chops are so tender you cut them with your fork. Whenever I serve them I get ask for the recipe." Heat a large lightly oiled skillet over medium-high heat. Brown pork chops on both sides. 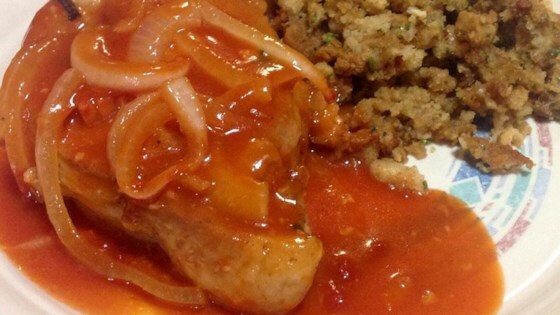 Place pork chops in a casserole dish and cover with sliced onions. Dissolve bouillon cube in hot water and mix with tomato soup. Pour soup mixture over pork chops. Cover casserole and bake in preheated oven for 1 hour. I really enjoyed this recipe. I added a little garlic salt, some worcestershire sauce, and basil. They were extremely tender. Very Good. An easy recipe my whole family enjoyed. It's a keeper!